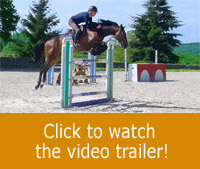 Riders have a tendency to lose the connection with their horse over the jump and on landing. This problem is accentuated when jumps are large fences like oxers, triple bar fences or water jumps as this profile of fences will trigger longer strides that riders can’t always control. To teach riders to manage this lack of control after the fence, Michel has set up an exercise that will solve the problem progressively while still making the rider and the horse feel secure. The rider will be able to practice keeping her horse responsive and under control in order to be able to slow down, speed up or get ready for another fence. The exercise also encourages the horse to remain focused on the rider’s aids whatever the goal is, after the fence. The session takes place in the outdoor arena with Marine who is riding her mare Amanda. First of all, Marine has to manage her mare anxiety as she’s new to Michel’s yard. 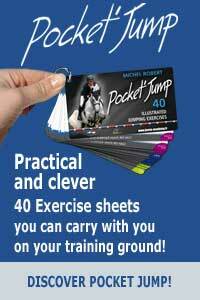 This exercise is perfect for it, as it doesn’t present any technical challenge for the mare either physical or mental. However, it requires some self-discipline from the rider in terms of position and mind control as she has to stay aware of her position after the jump. As the exercise goes on, Marine succeeds in improving the connection with Amanda. The mare is under control and steady after landing, which will allow the rider to direct the mare better when she’ll have to jump a course. As this exercise is not physically demanding for horses, you can practice it often, even if it means adapting the height of the jump or using ground poles after the oxer.